How well do you know your friend, family or members of your congregation? Do you know how the came into the truth? What made them decide to serve Jehovah? Or what Bible character they can most relate to? 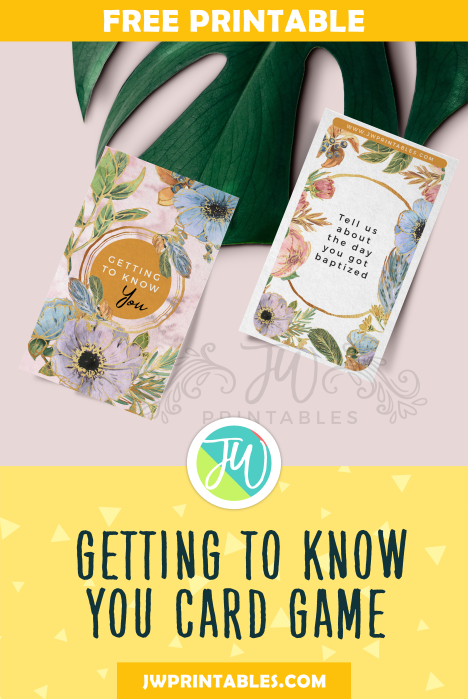 Getting to know you is a set of 48 cards with some really thought provoking spiritual and theocratic questions that you may never have thought of before. This game is honestly so fun! It’s perfect for gatherings, family worship or even in car groups in the ministry if you need some uplifting in-between conversation while you preach. 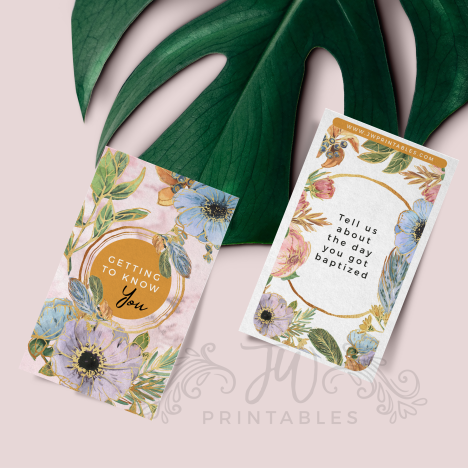 To assemble: Simply print out the pages on heavy card-stock paper. Double print on both front and back for the best effect. We hope this fun game will bring you closer to friends you already have and those you may not know yet. Have Fun! DIY Sticky Note NWT Bible! You’re very welcome! Have fun when you do have your gathering! Agape! Спасибо за ваши усилия! Очень интересная идея. Хочется перевести на русский и как можно раньше применить в компании. Не останавливайтесь! Пусть Иегова, благословит ваш труд! Thank you so much for the beautiful pioneer planner! It has exceeded my expectations and then some, to the point that I feel guilty for not ordering for the friends. Maybe next year. Aw, thank you Norma! So very glad to hear that you’re truly enjoying it! We send you all of our love. 🙂 Thank you for stopping by!! Thank you so much. This is such a nice way of encouraging one another. I may not be the creative type all the time so this gives me extra help to have something to engage her in. Thanks to Jehovah and thanks to you for the good work. Keep it up! Olá, como posso ajudar a traduzir este jogo para português? I think this is great card game, especially since our area will be have a major reorganization effective February. I was wondering if there is a Spanish version? I am so glad I stumbled upon this sight. Was wondering where some of the friends got their theocratic games. And now I know. Thank you so much. Love you much.